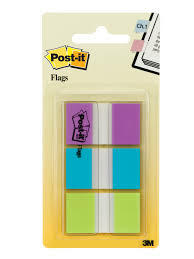 Post-it® Flags in a colorful 3-Pack. Includes 20 sheets each of Bright Green, Bright Blue, and Purple 1 in Flags. 60 flags total. Packaged in a clear portable dispenser.